On getting it wrong, along with another concrete example of getting it right. IT'S BEEN MORE THAN 12 YEARS since the first elaborately-scrutinized complete refund of ALL federal taxes claimed and collected from Americans by the United States. This has been followed by hundreds of thousands more such refunds by the feds and the state governments, as well, even despite vigorous resistance by tax agencies, in some cases. That first complete refund has also been followed by an ongoing series of tellingly-baseless and increasingly law-defying efforts to suppress the information about the tax that has led to all that returned and retained property and power. Every one of these unprecedented efforts by the state to discourage dissemination of this information and shore up the myths it exposes-- such as the never-before-in-America punishment of Doreen Hendrickson for refusing to declare a belief in those myths-- proves the truth of the information just as much as do all those refunds. You'd think that by now everyone in the so-called "tax honesty" movement-- especially the leaders in that community-- would have recognized and acknowledged that this unprecedented refund-generating and manifestly government-feared information is the path to liberation from the scourge of the misapplied tax for everyone. You'd think that by now these folks, and everyone else, would be speaking with one voice, spreading the simple truth about the tax. SADLY, IF THAT'S WHAT YOU THOUGHT, YOU'D BE WRONG, and what a shame that is. Were these folks to have begun spreading the truth about the tax five years ago, not one person without a legitimate liability would be suffering the least bit of harassment or harm today by a tax agency. Were these folks to do so today, five years from now (if not sooner) not one person without a legitimate liability will be suffering the least bit of harassment or harm by a tax agency. But rather than helping to achieve that happy goal, these "tax honesty" leaders are not only not spreading the truth about the tax, but some of them, at least, stubbornly continue to inject strained and empty "theories" and "arguments" into circulation through blog-posts, videos and emails. One of the most common and vigorously-promoted categories of nonsense is in regard to "jurisdiction." TYPICALLY, THE "JURISDICTION" ARGUMENTS revolve around assertions that jurisdictional limitations on the federal government prevent it from being able to make or enforce claims upon anyone not of a certain citizenship or a certain residency. This assertion is usually accompanied by the supporting proposition that somehow everyone being subjected to the income tax nonetheless is being administratively found to be of that certain citizenship and/or residency, even when they really are not, by some arcane legal legerdemain involving Social Security numbers or the act of filling out tax forms. For instance, the argument will be made that the federal government has no authority to make a claim of tax liability against a Texan living in Texas, being only able, according to the argument, to make claims against a very-narrowly-defined class of "United States citizens" or people resident in the District of Columbia or a US territory or possession. Thus, goes the argument, if the claim IS made, this is done because the victim is being found by the court to actually be a citizen and/or resident of DC, however vigorously and comprehensively this status is disputed. This bizarre argument will be made despite the many examples posted here of Texans defeating federal tax liability claims, and doing so while acknowledging Social security number assignments, and with no effort made to assert or dispute any particular citizenship or residency. The argument will also be made with no evidence in law or otherwise supporting its assertions about any of these allegedly significant factors. Instead, reliance is placed on tautological inferences-- assumptions used to support each other in an intellectual effort at raising oneself up by one's own bootstraps. It being imagined that the income tax is citizenship- or residency-based, aspects of the law by which the tax is applied will be assumed to be based on the assumption of those status qualifications. These compound assumptions will be shored up by out-of-context or incomplete excerpts from court rulings and statutes or regulations, and especially the assertion that things like having had a Social security number assigned conveys or implies the allegedly-significant status. Again, all of this will be done in complete disregard of the actual and contradicting evidence. AT BOTTOM, EVERY ONE OF THESE COMPLICATED HOUSE-OF-CARDS CONSTRUCTIONS are grounded in a confusion over the actual nature of the income tax in which the tax is mistakenly imagined to be like tribute demanded by an ancient king from his subjects. Were this true, jurisdictional considerations of territory and citizenship WOULD be relevant, and some explanation, however arcane, WOULD have to be found for how the tax is applied in apparent disregard of these considerations. But the tax is NOT tribute, and the taxing authority is neither that of a king, nor applied based in any way upon status. This can be seen in the most concrete fashion possible by all the examples here, not one of which involves any argument, assertion, dispute or declaration concerning citizenship or residency. Instead, the tax is an excise, and the "income" that it reaches is simply a special class of receipts which are liable to tax due to the federally-privileged character of the activity which produced them. Here's a good model for understanding the tax: If you use a federal lawnmower to cut other people's grass for money, the feds get to claim a piece of your gains. Understanding this to be the nature of the tax makes clear why the tax can be claimed from Texans in Texas without any issues of location or citizenship or need to rely on subterfuges or legal gimmicks related to either-- the liability for the tax goes wherever the federal lawnmower goes, and arises wherever and whenever it is used to make a profit, regardless of by whom. Understanding the federal-privilege-excise nature of the tax also makes clear that to say, "I don't live within your geographical area of authority;" or, "I'm not one of your subjugated or duty-bound citizens," as is advocated by those who promote these misunderstandings regarding jurisdiction, is a meaningless response to an assertion of tax liability. All that such declarations do is make clear to the taxing authority that the speaker is clueless about the arena he or she is in-- it is the pasting of a "Kick me!" sign on one's own back. I'M GOING TO CLOSE this discussion with an example of a proper response to an assertion of tax liability by someone who DOES know the law, and how to say she didn't use the government's lawnmower to make her money last year. After enjoying this latest display of accurate knowledge of the tax, please make a big effort to ensure that every "tax honesty" guru you are able to contact gets cleared up on the true nature of the tax and joins in spreading that truth. If you do, it could make all the difference in the world. Five years from now we could all be living in a restored republic under the actual rule of law. ...and she knows how to meaningfully introduce that fact into the record. Here is the filing Dana made that produced this acknowledgement and the return of her property and the power that comes with it. As in every case, this filing and claim was thoroughly vetted before being honored, per the protocols shown here. The simple, straightforward, endlessly-repeated reality of Dana's victory in invoking the actual tax laws thanks to the knowledge she gained from reading this book is completely unambiguous. What Dana acted upon are the real facts about the tax. CONGRATULATIONS, Dana! You're doing your part to keep the state within the confines of the law, like all the other truly patriotic and responsible Americans whose ranks you have joined. 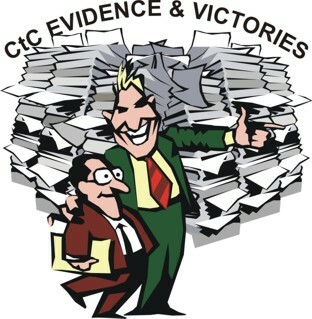 ON THE OTHER HAND, and regarding those who AREN'T doing their part to keep the state within the confines of the law, I'm going to be blunt: any "tax guru" or "tax professional" or bureaucrat or judge who disputes what is presented in CtC is a moron or a liar. And any "tax guru" who is telling anyone anything other than exactly what is found in CtC-- nothing more, nothing less, nothing different-- is actually part of the "tax dis-honesty movement". Help these folks learn the truth; encourage them to speak the truth; and just delete the nonsense when it shows up in your inbox.